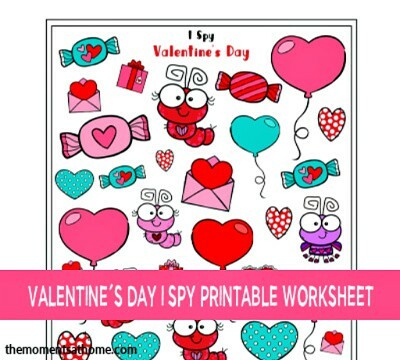 Valentine’s Day is such a fun time to create printable activities for kids and I’ve been busy making this I spy printable worksheet for my I spy series! Last month I shared a fun winter themed activity that is now available in my store, Rainy Day Work. What will next month’s theme be? Be sure to sign up as a subscriber to my email blasts to be the first to know of new printable activities. What’s your favorite thing about Valentine’s Day? I love sitting with my kids planning their class Valentines. Sometimes we get crafty and other times we buy them from a store. Last year we found pre-made Valentines at the store that had gel bugs attached to them. The kids loved them! They also have unicorn gel cling Valentines and more! This year I’m planning ahead and making Valentines with my kids here at home. They’ll be working hard on writing all those classmates names on the cards! The printable worksheet has a box towards the bottom of the page with pictures of objects that kids can find on the worksheet. Find hearts, candy, heart-shaped balloons, and more! The I spy printables in this series are made for younger kids from about preschool to 3rd grade. If you’re looking for printables for older kids head over to my Tween Parenting website! Are you looking for more Valentine’s Day activities for kids? Visit and follow my Valentine’s Day Pinterest board for classroom ideas, home ideas, crafts, decor, and treats! What’s your favorite family Valentine’s Day activity for kids? Tell me about it in the comments below!